John Middleton had already led a very active and healthy life during which much was achieved. He came to Lilydale in 1952 after service in the RAAF and medical training at Melbourne University. Although he had the opportunity to specialise, he chose to establish himself as a dedicated family doctor in what was then, a predominantly rural community. His fascination with wine began in his late teens and never faded. Mount Mary was the vehicle by which he fulfilled his dream to produce wines of great quality. And so it was that in 1971, John and Marli stumbled upon the property known as Mount Mary. Surprisingly this ideally located, gentle north facing slope had not been planted to the vine yet they immediately recognised it as being ideal for their purpose. 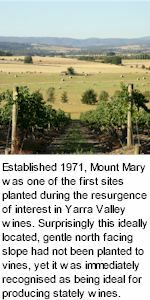 The first plantings were completed by mid 1972 and today Mount Mary has around 40 acres under vine representing 18 varieties of varying age and distribution. The low yielding unirrigated vineyard is almost 12.5 hectares and is planted on grey soils – sandy clay loams overlying degenerating Silurian shales. The vines face due north and capture optimum sunlight during the growing season. More than half the land area of Mount Mary is not directly related to wine production. The health of the property is of primary concern and there is a long term objective of being self sufficient in energy and water. The winemaking team are also keen to limit any impact on the environment through revegetation and weed control. The four wines produced by Mount Mary come from 10 varieties. Two wines are based on Bordeaux blends accounting for 8 varieties and two wines are the common varietals from Burgundy. Over the past few years, a Rhone Valley blend based on 7 varieties has been developed. The 18th variety is Pinot blanc. Mount Mary is a truly family business. All the Middletons share a great love of nature and an equally great disdain for authority and bureaucracy. John Middleton Sr was ahead of his time, he summed it up best when he argued that the classical Medoc balance has always been traditionally towards firm, cedar, cigar box, green olive, leafy Cabernet. All the great Bordeaux have powerful violets, cherry and mulberry, and the undercurrent of cedar, cigar box and green olive or leaf, not the jammy examples that taste like a sweetened dummy. Who wants a fruity red which with time in the cellar approaches more and more towards a dry port? Despite the many challenges that have been presented to Middletons over the years, progress towards environmental goals continue. Whilst there is still a long way to go in terms of becoming the ideal environmentally aware organisaton, Mount Mary have continued with their planting program and water and energy system designs. Revegetation areas are already attracting increased numbers of native birds. Snow Gum conservation area is looking good. Mount Mary is continuing with a program of collecting a variety of native seed for propagation. Also on the agenda is the completion of a gully wetland project. The ultimate goal of environmental works is to be energy and water efficient relying less on outside supply, provide additional habitat for native species and to limit any negative impacts by containing and treating waste products on site. Renewable power, water collection and recycling and redesigned facilities are at the centre of these improvements. It's all about making the greatest possible wine out of a totally clean environment.